Having decided that Willow the Vampire’s animal transformation number one is going to be Moly the Mole, I’ve now determined animal transformation number two will be the raccoon. It may not be a native to the UK, but there are many of these masked intruders out there in the wild – to the despair of birdwatchers and other native wildlife conservationists. Raccoons raid not just our bins, they have also discovered the delights of raiding our bird tables. As the perfectly equipped scavenger, raccoons in Stinkforthshire will have no trouble making a living and are therefore perfect for Willow to magically transform into. Don’t be too hasty in your judgment, dear jury – as usual it’s the fault of human villains, who thoughtlessly bought raccoon kittens and dumped them the very moment the animals had reached maturity – no longer cute, cuddly and playful, adult raccoons can be quite aggressive and difficult to keep. 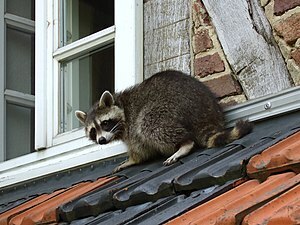 Their native homelands are really in North and Central America, but when in 2007 UK laws changed with regard to the keeping of unusual pets like raccoons, lots of foolish people thought, why not keep one – without ever making sure they knew enough about the proper keeping of such creatures. 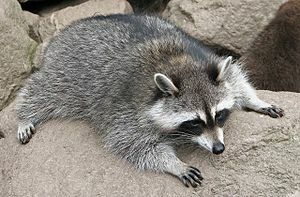 The raccoon family consists of 19 rather different looking species, to which our little bushy-tailed bandit also belongs. The Procyonidae, as they are formally known, include coatis from South America, kinkajous, ringtails and olingos. All of them are omnivores and they share the feature of very dexterous forepaws and almost human like digits. Raccoons are masters at raiding whatever happens across their way, using their paws to unpeel food scraps from paper wrappings for example. 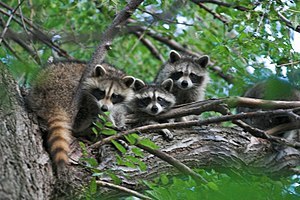 In the wild raccoons will eat whatever is available, from insects and small vertebrates to worms, fruit, nuts or seeds. They love to hunt for aquatic prey such as snails, crustaceans and small fish. 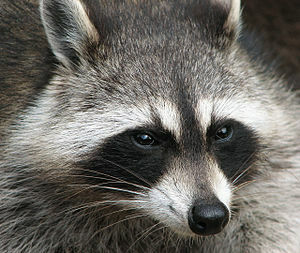 Male raccoons might travel alone or as part of a group, while females will live as small groups of up to four individuals. Like all Procyonidae raccoons are very vocal, with barking, squeaking, snarling and hissing. They love to sleep in large communal dens. Throughout the Willow the Vampire series I want my vampire heroine to experience what it’s like to live in different environments – underground like a mole, foraging in our dustbins and gardens like a raccoon or flying like a bat and hunting for insects with the help of sonar. She will experience the joys of homebuilding as a badger, curse the discomfort of being a water vole when your home gets flooded and will no doubt enjoy a day out as a vain Wildcat on the prowl. As the series continues, it will become clear, why Willow the Vampire is getting to know animals on such intimate terms – but there won’t be any spoilers from me…you’ll just have to be patient and read for yourself! If you could keep an unusual pet without the animal suffering in any way from being kept as a pet, what would that animal be? I’d love to have an elephant, but I’d have to sell my condo and buy up a rain forest so it could roam free. I think I like the idea of a fox. It would have to be something that would cuddle up to me as I read like my beagle. When I was little my uncle worked as a customs officer at the German/Dutch border. He was a hunting man and one day he found some idiot had killed a mother fox and her babies, but one was still alive. He “adopted” the fox cub/kittten and brought it home. My cousin and I used to walk the fox like a dog on a leash – to the amusement of passersby. Foxes do not make good pets – they smell for a start, can’t be tamed, but are fascinating creatures. This one was able to mimick the sounds pigeons make…no doubt to be able to sneak up and grab one for lunch! My uncle eventually managed to release the fox into the wild, but every winter, he left his basement window open and occasionally there’d be tracks in the snow, showing the fox had come back to say Hello! Copying bird sounds? Now I like the idea of a fox under my cockatiel’s cage so the two of them could chatter at each other. I know that would really just be asking for something bad to happen, but it’s cool to imagine. Hi Magsx2, that’s why I chose them! I want my vampire girl turned raccoon to have some fun with humans, irritating the living daylights – or rather night time – out of them, hehe. I love the idea of Willow finding out how different animals live. It reminds me of Kafka’s Metamorphosis. Oh don’t you start! I’ve just managed to get that whole Kafka business from that awfully mean, jealous “critic” woman out of my system:) Please read Mr T H White, if you haven’t already done so. The Once & Future King and Book Merlin…then you’ll guess why Willow the Vampire is exploring “animals’ lifestyles”. Sorry to touch a sore point. That woman is doing nothing for Literature, even though she seems to think she is. It seems she is turning people off Literature. Forget her, you are fabby. What is going on with Kafka? Oh that woman didn’t know anything about literature in general and vampire genre or children’s books in particular, so she assumed that vampires turning into bats was pinched from Kafka. Silly woman. Think of what Willow becomes at the end of the book, what powers she’s going to possess. TH White’s Merlin teaches Prince Arthur to respect and understand all creatures, not just humans – that’s where my inspiration came from, not from Kafka. Also, there will be a more practical use for Willow’s friendship with animals…no spoilers from me, though:) except to say, humans beware!